Bindi is a small piece of velvet cloth with suitable glue. It is available in different colours, size and designs. Bindi is widely used by Indian women on daily basis. It is regular consumable item used by Indian women adding grace to the personality with a dignified outlook. Bindi is equally used by both married and unmarried girls in India. Bindi is a consumable item and popular in both rural and urban women. The demand of Bindi is increasing as ladies prefer to wear it in different colours and designs. Bindis are the least expensive cosmetic item and almost all the ladies of all age groups use it. It is very easy to apply. The demand of the product exists and grows with the increase of female population. You can start Bindi making business at home with comparatively low startup capital. And can earn handsome money out of this business. The main raw material required for Bindi making is velvet cloth. Some other essential raw materials like various stones, adhesive, glue and other consumables are also required. Adhesives are required to coat on the one side of the Bindis for affixing. The adhesive normally used in dextrin. You need some packaging materials as per customers demand. Bindis are made by first gumming and pasting on the back of cloth followed by cutting and pasting with the help of dies and cut pieces are pasted over separate paper sheet. The adhesive may be coated and passed through hot air chamber for drying the adhesive. The sheet is then cut to form proper shapes of Bindis by using punching machine. 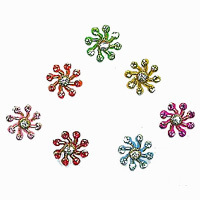 Bindis are either packed in a box or wall hanger as per the requirements of the customers. Quality of the product must be as per customers demand and it contain only skin friendly chemicals. For making Bindis you need to install Bindi printing Machine, Bindi Cutting Machine, Adhesive Coating Machine, Drying Machine, Punching Machine, Dies, Hand Tools, Electric Motors etc. You may start Bindi Making Business by having some hand tools also. The quality control standard in Bindi making is the cloth and adhesive should be skin friendly. Here I am very sorry, because I could not collect sufficient unfailing information on Suppliers or Manufacturers of Bindi Making Machines.